Summer crashes to an end on a winding road. Just like that, football superstar Joel Harper finds himself rolling his wheelchair into a new school in a strange town. Soon he’s making friends of misfits, taking lessons in Iron Maiden, and trying to keep away from a ruthless bully with a penchant for switchblades. Little is he aware, something ancient and wounded has awoken deep beneath the tiny mountain community, and when it surfaces, all of Honaw will know its pain. Anyone who has read my reviews for a while knows that I’m a huge Daniel Barnett fan. I was thrilled to hear that his latest book, Poor Things, might fall into the YA spectrum. Barnett’s writing is pure poetry, and this one is his goriest, grittiest yet. I’d say it rests rather precariously on the young adult line, and it would certainly appeal to adult horrorphiles, because this author never pulls any punches and his hits can be brutal. 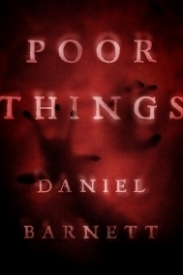 Poor Things is bloody and frightening, with language not meant for virgin ears. Parents, if you think your little miracle isn’t ready for something along the lines of Steven King’s scariest tales, this isn’t their book. The town of Honaw itself has enough personality to be thought of as another character--an odd and mildly disturbing one from the beginning. Or, rather, the thing which lies beneath Honaw engineers that creep factor. Okay, that’s it! I can’t say any more or I’ll give it away. Yet, bells and whistles aside, this is a classic monster tale. No monster I’ve ever imagined, however. Only Daniel Barnett could imagine such a strange, sad, dangerous beast from the depths of time, and only this guy could make me love that thing by the end.